Algeria is a country in northern Africa, extending between the Mediterranean sea in the north and the Sahara desert in the south. With an area of 2.4 million km² it is the largest African country and the 10th largest country in the world. 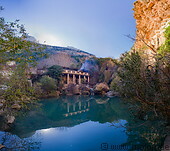 The north of Algeria is mountanous, with the Atlas mountain ranges running parallel to the coast. The Sahara desert starts south of the Atlas mountains and is mostly flat in Algeria except for a mountainous region in the south, the Hoggar mountains. 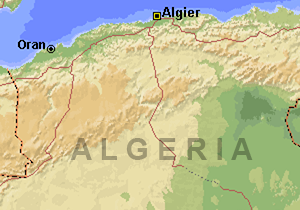 Algeria has been inhabited since prehistoric times. After the defeat of Carthage, Algeria became part of the Roman empire for 400 years. Islam spread into the country in the 7th century. Between the 12th and 16th century Algeria was ruled by the Almohad caliphate; after it became part of the Ottoman empire. Between 1830 and 1962 Algeria was a French colony. Algeria has a population of 42 million inhabitants and its capital is Algiers, which is located in the north along the Mediterranean coast. Due to its large oil and gas reserves, it is a relatively wealthy country. It is possible to reach Algeria by plane or ferry from Europe. Hotels are available, but only few of them are bookable via the international booking portals.